By Randy Donowitz August 14, 2003 marks a singular day in US history when a series of technological failings caused a prolonged massive failure of electrical power that stretched over parts of the Northeast, the Midwest and into Canada. The massive power outage affected the lives of millions of people. Amidst the myriad of real human drama and strife, a particular kind of madness took hold of the small subsection of the population we call aquarists. For perhaps the first time in the history of our hobby, large numbers of our community were simultaneously staring face first at one of the fundamental realities of modern aquarium keeping: without electricity our aquariums are doomed. Water movement, temperature, filtration, lighting and virtually all of the techniques we commonly use to keep our systems alive are predicated on the consistent availability of electricity. 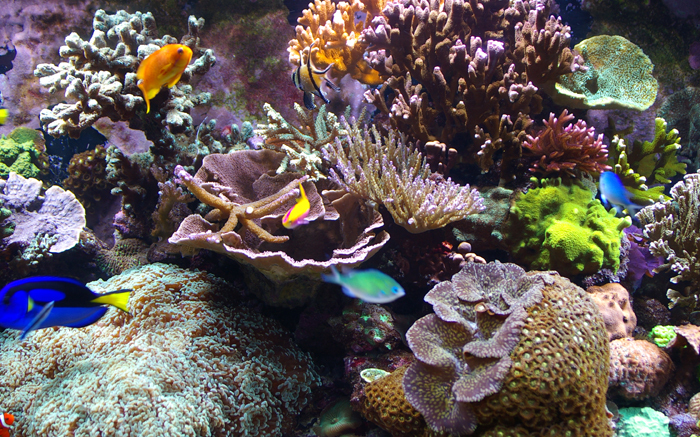 I hope my own frenzied experience to save my numerous reef systems will serve to illustrate how swift action, creativity, and a solid understanding of the most critical needs of your aquarium can save you from complete disaster. First, some background information. I am the Director of the Writing and Tutorial Center at Pratt Institute in Brooklyn, New York, a small college dedicated primarily to the study of Art, Design and Architecture. Over the years, I have been able to set up three large reef systems (200g. 125g. and 72g.) in a highly visible, heavily trafficked area of the campus. Being located in New York City, and relying on the infrastructure of a college campus, I rarely if ever thought of a prolonged power outage as a likelihood. In fact, in spite of my experience as an aquarist, I was totally unprepared for the massive event of 8/14/03. Fortunately for me, I was in the office when the power went out. I remember well the sickening feeling as all the lights in the room kicked off, and the hum of my pumps went dead. The silence was deafening. It quickly became apparent that this was a serious situation as word trickled in that the power outages were far-reaching and not localized in my office, my building, the campus or even the neighborhood. I knew I had to think about how I was going to deal with my reef systems, as their time without attention was very limited. It was here that my ability to quickly prioritize the needs of my aquariums was critical. I organized a few of my staff members to run out and gather candles and batteries for flashlights in case it turned into a long evening. I then turned my attention to how I was going to deal with keeping dissolved oxygen at levels sufficient to keep my aquariums alive. This should always be your first priority, as these levels will drop quickly, particularly in heavily stocked reef aquariums, causing the suffocation all living things one-by-one. Large animals like this Tridacna squamosa consume oxygen rapidly. During a power outage, swift action must be taken to address dissolved oxygen levels. Photo by L. Mann. Because I had not planned for this kind of event, I was left with few technological options readily at my disposal. With little other choice, I grabbed a few cups and plastic containers and began to manually move water back and forth over and over again trying to create the most water movement and surface agitation at the same time. Surface agitation facilitates gas exchange and helps oxygenate the water, while getting the water to move below the surface helps keep the corals from suffocating in their own slime and waste products. Needless to say, this is a very labor-intensive procedure compounded in my situation by the size and number of my systems. Creative Responses It quickly became apparent that this strategy was only viable for a few hours at best and unfortunately, radio reports indicated that the power outage was going to be prolonged. One ray of hope came when Samantha Lopez, my student assistant, arrived and volunteered to help me out as long as need be. At least I had another pair of hands and a little time to think. There had to be a better way to provide more agitation and water movement with less effort. Then the light bulb went off in my head (how I wished it was a real light bulb) and I remembered an article by Craig Bingman that was published a number of years ago in Aquarium Frontiers. In it he detailed how to mix a batch of synthetic seawater quickly and easily with the use of a drill and paint stirrer bit. 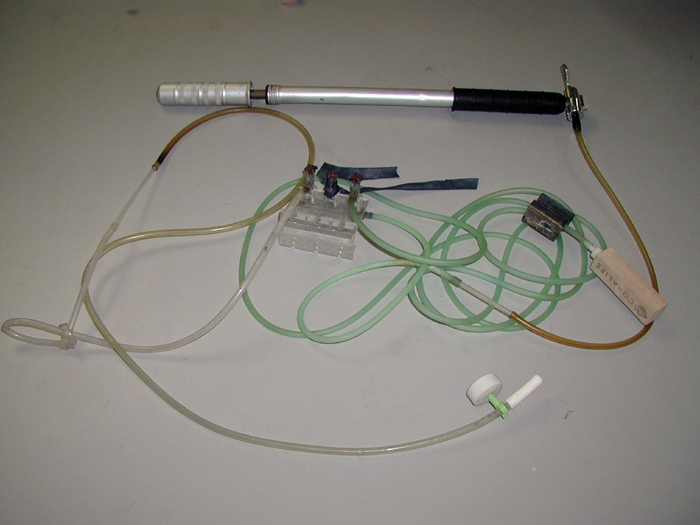 The idea was that using this technique, it was possible to whip enough air into the mixture to bring the dissolved gasses into equilibrium quickly and easily, thus eliminating the need to let the mixture mature over night. I have been doing this successfully for years, so I happened to have the proper paint stirrer attachment and cordless drill at my disposal. I also happened to have a recharged power pack. Paint stirrer on a cordless drill and battery powered air stones. As it turned out, this was a very creative way to greatly increase the surface agitation and water movement in the aquariums with less physical effort. I knew I still had limited power because I couldn’t recharge the drill, so we alternated between the drill and the cups for hours. At least we were able to sit down and rest for a few minutes between cycles because of the increased efficiency of the process. At this point, I should say a word about temperature control. Luckily for us, temperature was not a concern as it was neither too hot nor too cold that day. In general, temperature should be your second concern after oxygenation. Remember you are in triage mode so anything in the 70-86 degree range is acceptable for up to 48 hours. If you need to cool off your aquarium during a power outage, it is useful to keep trays of ice cubes or jugs of frozen water that you can float in the tank as needed. If you haven’t prepared in this way in advance, you might want to think about things in your freezer that are defrosting anyway, wrap them in plastic and sacrifice them to the project. If you need to keep the aquarium warm, an excellent item to keep handy is a Mylar “space blanket” that is commonly found in roadside emergency kits for cars. These blankets are very thin, lightweight, and hold in heat very effectively. Wrapping one of these around your aquarium should help limit temperature loss considerably. A Long Night’s Journey into Day Even with the cordless drill and Sam’s extra hands, it was going to be a long night and the radio reports were not encouraging. It was well past midnight, and though I was able to secure a second drill, our power supplies were beginning to run out, and we were mentally and physically exhausted. We decided to sleep in shifts, and forge ahead bolstered by the fact that nothing seemed to be dying as evidenced by the physical appearance of the organisms we could see via flashlight, and more importantly by the lack of putrid odor emanating from the aquariums. In truth, it was impossible to accurately gauge the health of the animals, particularly the fish, which for the most part were hidden amongst the rocks. Quite amazingly, we made it through the night and headed into the next day as drained as the batteries in our flashlights and drills. As daylight began to fill the room, we could see, much to my surprise, that even the largest of the fish were not showing any severe signs of stress or oxygen depletion. Still, it was clear we couldn’t keep this up much longer. It had been nearly 18 hours since the power failure and without a change in the situation we were going to begin to lose the battle. 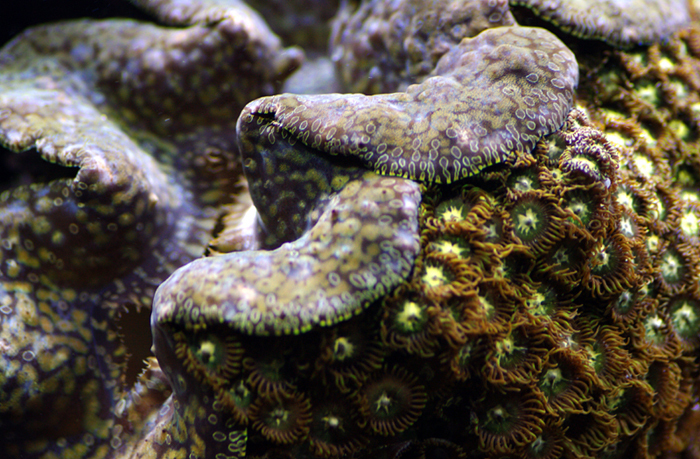 I began contemplating radical triage efforts such as consolidating the most valuable of my corals into one system and spending all my energy to save them alone, or at the very least removing organisms such as Xenia that have the potential to release lethal toxins when they are stressed. 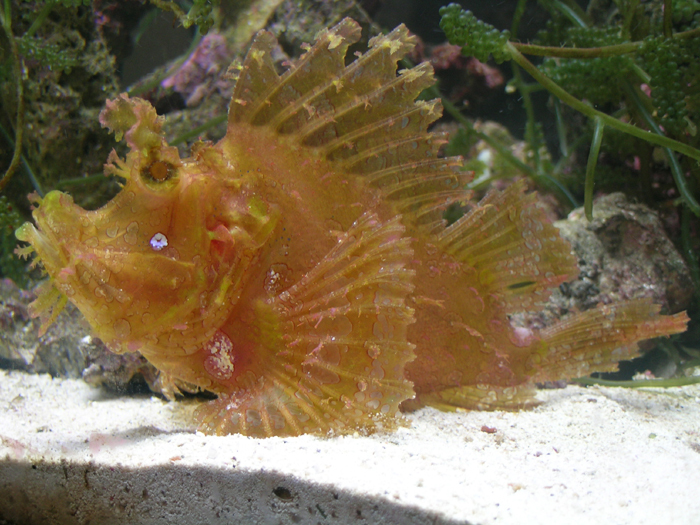 If a power outage becomes prolonged, it may become necessary to make some tough decisions and work to save only your most prized fish or corals like this Rhinopias Scorpion fish (Rhinopias frondosa). The Bicycle Rescue Unit Around 8:00 something quite miraculous began to occur. Despite the fact that the campus was closed, and that none of my staff had to report to work, several of my staff members began to show up simply because they figured out what I must be going through to save the aquariums. While I appreciate all who made the effort, it was the die-hard bicyclists who saved the day, particularly Joe Herzfeld who quickly reasoned that he might have a stopgap solution to our problem. Realizing that inputting large quantities of air into the aquariums was our primary need, he began to scrounge around my large used equipment piles pulling out tubes and air stones and diffusers. 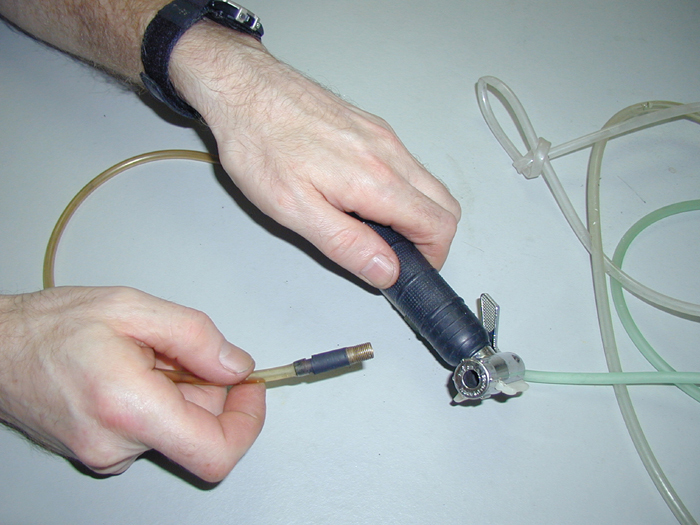 By chance, he had an old bicycle tire inner tube with him and he quickly determined that the Schraeder valve from the tube could be easily retrofit to aquarium airline tubing enabling us to connect the bicycle pump to an air stone. All that was required was to strip away the rubber from the valve exposing the nub on the back end. The nub is just the perfect size for standard aquarium airline tubing. This proved to be a stroke of creative genius as we were then able to effortlessly infuse each aquarium with fine air bubbles from lime wood air stones simply by operating the pump. 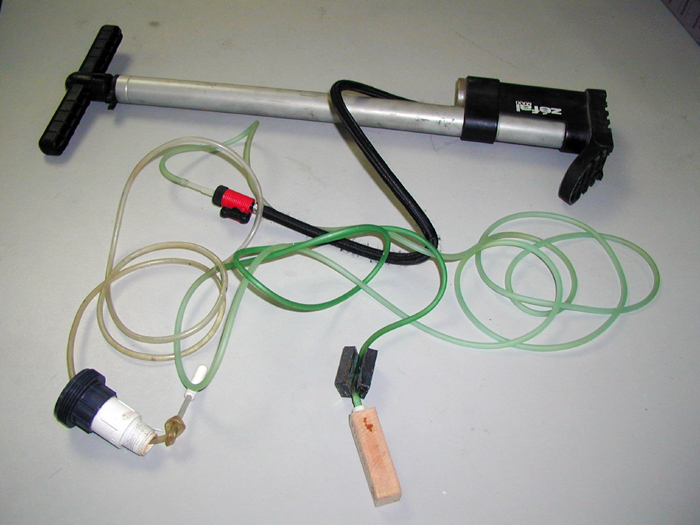 The air output/effort input ratio was so dramatically increased that we realized we could tee off the airline tubing and attach two air stones, enabling us to treat two aquariums at the same time with the same effort. The process was even further refined when Joe went home and brought back a larger floor pump that could be easily operated while seated and with even less physical exertion. 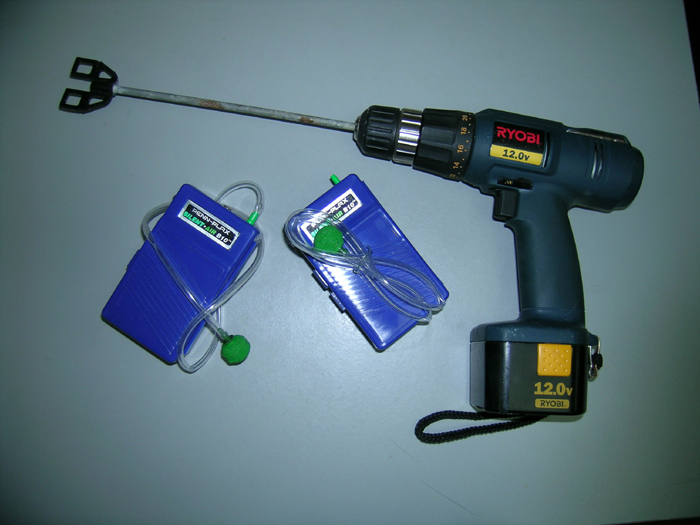 Emergency Kit – What I call my emergency kit is a box that contains a cordless drill with paint stirrer bit, a bicycle pump fitted with lime wood air stones, candles, a flashlight, a lighter, and a Mylar blanket. As I have detailed above, these items have proved invaluable to me, and are easy to store, no maintenance items that there is no excuse for not having on hand. Combining any or all of these options, as is appropriate for your situation will give you the greatest chance of averting total disaster in the face of a prolonged power outage. I truly hope you never need to put any of these strategies into action, but I think you will agree it is better to be prepared than sorry.